On March 15th 2019, join and support the Global Climate Justice Strike For Future! On March 15, along with NGOs in 40 countries on all continents, we will support the call to the youth and all citizens of the world to join the Global Strike For Future! Let’s show the world that the Climate Crisis is a Crisis! Let’s show the world that the demand for Justice is an Urgency! Do link climate action and social justice! or against, people living in poverty! In a context of successive international meetings about the new Sustainable Development Goals (SDGs) and reducing the negative effects of global warming, ATD International has upped its advocacy to emphasize the inextricable link between climate action, sustainable development, and poverty eradication. From action and research on the ground, we have issued two memorandums and a series of short videos illustrating these links. This statement reminds stakeholders that a framework with international consensus exists already in the United Nation’s Guiding Principles on Extreme Poverty and Human Rights. 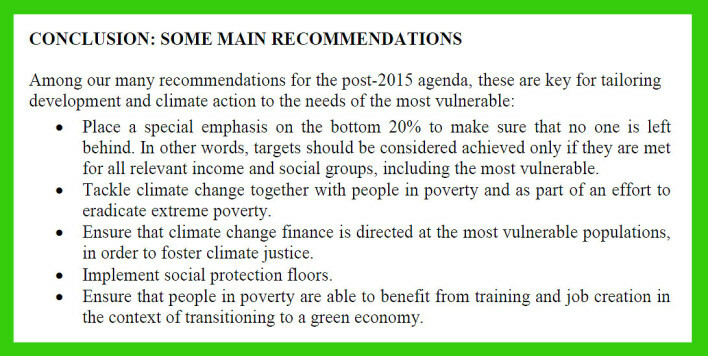 ATD’s more in-depth memorandum, Taking seriously the commitment to “leave no one behind” in the SDGs and the fight against climate disruption, further proves the effectiveness and necessity of including people struggling daily to overcome poverty, when designing development strategies and climate action. A series of short video clips illustrate each of ATD’s five main recommendations, from reaching those deepest in poverty, to promoting green jobs and training. For the past 20 years, Martin Byrne, volunteer & member of the Board of ATD Ireland has been collecting North Wall stories and publishing them once a year. These stories are coming from a range of people and the book encourages people to dig deep and write down those stories that have been hidden away for so long. We are so proud of the commitments our friends and volunteers who have a text in “Melting The Middle Class Gaze“! The book launch will take place on Tuesday April 30th at 7pm and thanks to the generosity of Lord Mayor of Dublin, Nial Ring, it will be hosted in the Mansion House, Dublin 2. If you would like to attend, please contact info@atdireland.ie. Does it only happen to me? Share your story before May 31st, 2019! From January 2019 to September 2019 ATD will carry out a project exploring the issue of socio-economic discrimination in Irish public services and in every day life. A person’s socio-economic status is not currently recognised as a ground upon which a person might be discriminated against, under Irish equality legislation. Share your story before the end of May 2019! The first step of the project (before the end of May 2019) is collect anonymous real life stories to showcase how this type of discrimination or unequal treatment is unfortunately too common and needs to be recognised within legislation. The stories collected will be published into a report that will be launched at a public event after the Summer in the IHREC Auditorium. All the stories collected and published will be kept anonymous to ensure the confidentiality of the participants. Today in Ireland several grounds of discrimination are officially recognised within equality legislation: it is illegal to discriminate against people because of their age, gender, sexual orientation, race, disability, religion, civil status, family status and membership of the Traveller Community. Since 2016, another ground has been added to cover housing assistance payments (HAP). This means that people who feel discriminated against under one or more of these grounds can bring a complaint to the relevant legal body (see www.ihrec.ie for more information on how to make a complaint). However, ATD Ireland, along with many other organisations such as EAPN, INOU, the members of the former Equality and Rights Alliance (ERA), believe that one ground is missing from Irish legislation. That missing ground is called “socio-economic status”. Socio-economic status or background may sometimes be referred to as social class based discrimination. For instance, someone could feel like they are being treated less favourably than others by the Gardai because of where they live. Other people recalled being treated differently at school because their families could not afford to buy school books, or how they were asked to leave class because they were not wearing the ‘right’ shoes and how they felt belittled and embarrassed by the attitude of teachers. This leads to lack of confidence that is often carryout out through adult life as well. Sadly, many have stories like these that showcase ways in which people are excluded or not treated with dignity and respect. But because socio-economic status is not covered in equality legislation, this kind of discrimination often goes unnoticed and cannot be reported legally. In addition to allowing victims of discrimination to file a legal complaint, a change in legislation will have an impact on what is called the “Public Sector Duty”. What does this mean? The Public Sector Duty is a statutory obligation for all public bodies to work towards the elimination of discrimination, promote equality, and protect human rights in their daily work. This Duty applies to people working in public services, service users and more generally everyone impacted by policies coming from public bodies. If socio-economic discrimination is recognised in Irish law, all public services would be obliged to take the necessary steps to ensure that their employees and service users are protected from this kind of discrimination, as is the case for the other nine grounds of discrimination currently recognised. We know that this change in legislation will not mean that socio-economic discrimination will disappear tomorrow, but we see this as a necessary first step in recognising that this kind of discrimination does exist and needs to be challenged if we are to live in a society which treats everybody with respect and dignity. or to share a story? We are looking for people from all around the country to take part in this project. If you have a real life story of a time where either you, or someone you know, had an experience of being discriminated against, and if you felt that this discrimination was because of your socio-economic status, then we would love to hear from you. This discrimination may have taken place when dealing with a public service or in another situation of every day life! All the stories collected and possibly published (with individual consent) will be kept anonymous to ensure the confidentiality participants. If you are interested in taking part in this campaign to introduce an additional protection against discrimination into Irish law, then feel free to get in touch with us! if we are not ourselves part of it. as long as we do not have proof to the contrary. We must welcome political discussions and the sharing of ideas, and we must love people who defend what they believe in. Whilst not being sidetracked, we have to share in the hopes of all those who fight for a cause. On 14 February 1988, 31 years ago, Joseph Wresinski passed away. He was 71. He is the initiator of the United Nations’ #EndPoverty Day (each 17 October) and the spiritual father of the UN Guiding Principles on Human Rights and Extreme Poverty (adopted in 2012) and one key inspiration to implement the Agenda 2030 “Leave No One Behind” promise. Together with French sociologist Jules Klanfer, he first introduced in 1965 and developed the concept of “social exclusion”, now a concept broadly used worldwide. All his life, he was a strong advocate of people trapped in chronic poverty for generations. The “Wresinski approach” inspires new ways to fight poverty worldwide. It recognises people with experience of poverty as partners in designing, implementing, monitoring and assessing public policies. In 1957, Wresinski founded the NGO ATD in a slum near Paris which has become today the International Movement All Together in Dignity with 100 projects in 40 countries. On 14 February each year, friends of ATD are invited to read and reflect on the very last address made by Wresinski. He wrote this to the long term volunteers from his hospital bed just days before his death on 14 February 1988. Joseph Wresinski was born on 12 February 1917 to immigrant parents, detained in a French internment camp because of WW1. Later, his family suffered from chronic poverty and social exclusion in a poor neighbourhood of Angers, France. In 1957, Joseph Wresinski and the families of the camp founded the first association which was later to become All Together in Dignity Fourth World. Responding to the demands of the families and working with them, the soup kitchen and the distribution of old clothes were replaced with a library, kindergarden, chapel and workshop. Volunteers came to join the action and a Research Institute on extreme poverty was created to bring together researchers from different countries and disciplines. Since its beginning the development of ATD was inspired by Joseph Wresinski’s own experience as a child in a poverty-stricken family and by his daily contacts with families in extreme poverty and members of ATD International Long Term Volunteer Corps. His appointment to France’s Economic and Social Council in 1979 was a significant step in his quest for official representation of people in extreme poverty. With the publication in France of the “Wresinski Report” in 1987, he succeeded in gaining recognition of people in poverty as partners in society. This report enabled him also to put “extreme poverty” on the Human Rights agenda. 17 October was declared “International Day for the Eradication of Poverty” by the United Nations in 1992. In several countries, each year or even on the 17th of each month, people gather for a short commemoration in honor of people who suffer from extreme poverty, and to renew their commitment to fight alongside them. The “Corner Stones” project to be launched on Social Justice Day! At the occasion of 2019 World Day of Social Justice, ATD invites all citizens interested to the launch of “Corner Stones”, a creative project aiming to prepare a wall with the 700 decorated stones created dutring the “Your Rights Are Written in Stone” Campaign run in 2018! From February 20th to April 20th, a series of workshop will be held in the North East Inner City to design and eventually build the “Corner Stones Wall” in the NEC Farmer’s Hill Communnity Garden! This project is supported by a grant from the 2018 NEIC local grants round 2 Programme.